These photos were taken on a road trip we took last year through Arizona and Utah specifically to visit Zion National Park, Bryce Canyon National Park, South Rim Grand Canyon and Sedona. 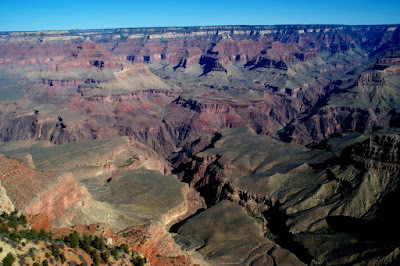 While both terra's are vast and expansive, the buttes of the Grand Canyon, lush with lichen and rising from the Colorado river seem smooth. 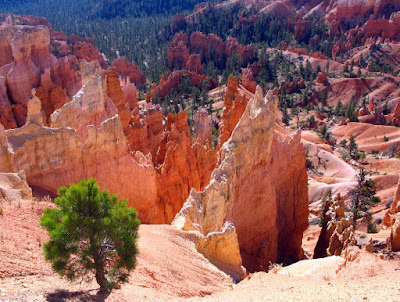 In comparison to the rough terra at Bryce Canyon, where the landscape is vast with rugged spires and pinnacles that rise from the deep canyonlands. My other blog playground: "ThE ArTfuL EyE"
What gorgeous photos! You take the neatest trips! That pine is like my patience - strong but thwarted...bonsaid abiliuty to cop[e - ha ha. This looks like a truly memorable trip. it must have been amazing. Thanks for your kind words....always nice when you visit. My best to Gerard. Andrea: My apologies. I totally missed these. I'm adding them to the 2 Things blog now. I love that country. I grew up near there in N. AZ, so it brings back fond memories!